Krill Oil is a rich source of Omega 3 EPA/ DHA fatty acids and is more efficiently absorbed by the body than Fish Oil as the fatty acids are contained in a phospholipid structure. Krill also contains astaxanthin a powerful antioxidant. Krill oil is a natural source of the vitamins A, D, and E. Studies have also shown that the DHA and EPA found naturally in krill dramatically helps with lowering cholesterol and reduces the factors of heart disease. 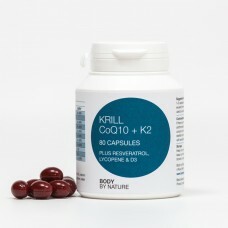 Krill oil can support in the treatment of osteoporosis. One of the things EPA can do is increase the calcium in the body, which deposits onto bones and improves bone strength. Phosphatidyl Choline: Krill phospholipids contain choline, a vital nutrient, and neurotransmitter precursor essential to brain and muscle tissue. Phosphatidyl choline participates in fatty acid transportation in the blood and across membranes. We need to consume Colline and it’s important we start early and continue into our later years. Deficiency has been linked to memory, growth and hepatic disorders. You can find the best source of Coline in food such as liver, eggs and wheat germ. Another power ingredient in pure krill oil is Astaxanthin. Astaxanthin is becoming very popular among nutritionists that would like better health through vitamin supplementation. If you do not eat a lot of seafood, you may be deficient in this nutrient. This is one of the main reasons why many people are taking to Body By Natures pure krill oil these days.